The cover photo of this book of mine, Keeping Score In America, is an image of myself at my most contented and when most at peace. I'm studying a piano reduction of Béla Bartók's 2nd Violin Concerto. I first heard a recording of that 20th Century Classic in my early twenties out in Boulder, Colorado at the University's Shakespeare Festival. It was also there I attended a performance of Arthur Honegger's Joan At The Stake. Those relatively early tastes of Bartók and Honegger set the course for my middle and late years in life as a composer. Meanwhile I was fortunate enough in that same educational venue to attend a lecture by America's greatest professor of jazz piano, John Mehegan. I remember giving my one, cherished but raggedy old copy of John's Jazz Improvisation to the great acting maestro, José Ferrar. Mr. Ferrar adored jazz piano and, as with anything else he loved, he treated its mysteries with utmost reverence. José Ferrar had attempted to direct me in a stage version of Thomas Wolfe's The Web and The Rock. Of that experience? Well… much of such melodramas anon! Suffice to say that experience, as José predicted – plus many others like it – would "put muscle on my soul." How exquisitely right he proved to be about the coming fifty years in professional entertainment. As for the stories that are to come in this book? After fifty years in the American theater, film and television and battling some painfully famous hypocrites in politics, I and my growing senility have both become "cantankerous". Know of no better word for it. Apropos of my biography's title, my grandfather, George Joseph Moriarty, was a colorfully well known "Score-Keeper" in American baseball. He umpired five World Series. Frequently fought more than one ballplayer at a time to defend his "Umperial" decisions. All that after having played third base with the intimidating likes of Mickey Cochrane, Sam Crawford and Ty Cobb. I grew up with the legend of my grandfather's, "Big George's" fist-flying commitment to fair play and the accuracy of his "balls and strikes"; not-to-mention the speed of his base-running. Though I never inherited either his baseball talent, his speed or his boxing skills, I've never run away from a fight… except for one. That was when I left America over fifteen years ago for Canada. The odds against me then were quite beyond both my abilities and my considerable patience. If America wants the likes of the Bushes, the Clinton's, Janet Reno and Barack Hussein Obama to make life miserable for them, they can suffer the fruits of their horrid tastes in leadership without me. This offering, Keeping Score In America, created for my oldest and most revered writing venue, Enter Stage Right, follows the over forty-chaptered memoir I entitled An Ecstatic Loneliness. Everyday events in North America and round the world easily defeated my attempts at personal reminiscence. This second effort feels much more promising. I seem to have made a friend in the very Belly of The Beast, Washington D.C. The Washington Times now prints my political, spiritual and miscellaneous musings with wonderfully editorial panache. That frees me to keep my promise to one of the most wonderfully loyal friends I've ever had in my life, Steve Martinovich of enterstageright.com. Every writer should have at least one Steven Martinovich in his or her life! As for what is to come in this new tome of mine? A very, very, very relaxed look down memory lane. Hustle-bustle in my life is over. What intensities still exist, I save for my political columns, most of which I've previously written here in Enter Stage Right. Why have I chosen Steve's creation to share my life in? I'm most at home here in Canada. The "why" of that is one of the main reasons I'm writing this. Therefore I won't try to dump it all on you in this introduction. At my age and at the pace I keep now, it will take me over a year to even complete a first draft of Keeping Score In America. You will have had the questionable privilege of having read it in rough draft. God willing such a miracle happens before my hopefully graceful passing. The published version, if there is such a thing, will have many more photos than this first attempt. "One thing at a time!" 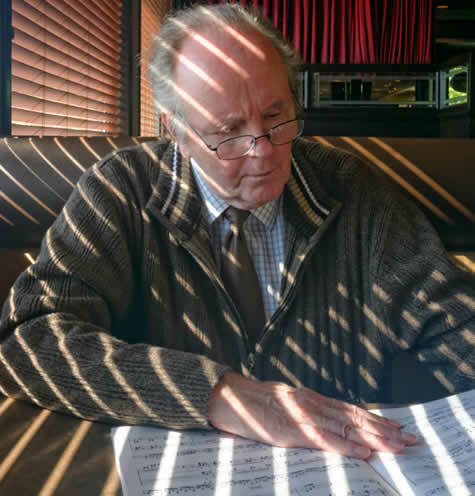 What's the point of reading Michael Moriarty's Keeping Score? This bleacher seat in Canada at the end of my life. With both a laptop computer and a portable TV in my possession?! No better way to see the whole ballgame from start to finish, including close-ups on every major member in the audience. Michael Moriarty is a Golden Globe and Emmy Award-winning actor who starred in the landmark television series Law and Order from 1990 to 1994. His recent film and TV credits include The Yellow Wallpaper, 12 Hours to Live, Santa Baby and Deadly Skies. Contact Michael at rainbowfamily2008@yahoo.com. He can be found on Twitter at https://twitter.com/@MGMoriarty.